Here is a classic problem given to students in statistics classes: "How many molecules of Caesar's last breath do you inhale every time you breathe?" To answer the query, no scientific testing is required. Instead, students are asked to use mathematics in an effort to work their way to a guesstimation. This type of question is called a "Fermi problem," where answers are found to seemingly impossible questions based on setting out clear approximations and assumptions. With this sort of analysis, you can get answers to questions even as crazy-seeming as, "How many molecules of Beyoncé's breath do you inhale every time you breathe?" Before going any further, let's note that Beyoncé's breathing is particularly notable. In the 2004 Destiny's Child single "Lose My Breath," Beyoncé -- along with Kelly Rowland and Michelle Williams -- sings, "Can you keep up? / Baby boy, make me lose my breath / Bring the noise, make me lose my breath / Hit me hard, make me lose my..." Then they all breathe heavily. Aren't you at least a little bit curious how much of these Queen B exhales end up making it into your own plebeian lungs? To answer that Beyoncé-related Fermi Problem, The Huffington Post reached out to Professor Lawrence Weinstein of the Old Dominion University Department of Physics and co-author of Guesstimation: Solving the World's Problems on the Back of a Cocktail Napkin. Professor Weinstein was game to take on this pop culture Fermi problem quite thoroughly, this despite its ridiculous nature and Professor Weinstein certainly having more important things to do than humor us about Beyoncé. All text below has been written by Professor Lawrence Weinstein and formatted/illustrated by The Huffington Post. How much of the air you just breathed was once breathed out by Beyoncé? Let’s start with an easier question: How much air did Beyoncé just exhale? When you exhale you can certainly fill a 1-liter soda bottle, but not a lot more than that. However, that 1-liter of breath contains 3´10^22 air molecules (this comes from high school chemistry where one mole of gas contains 6´10^23 molecules and occupies 22 L of volume at standard temperature and pressure). How big is the entire atmosphere? To answer that we need to know (or Google) a few numbers. The volume of the atmosphere equals the surface area of the Earth (4´10^14m^2 or 400 million-million square meters) times the height of the atmosphere. 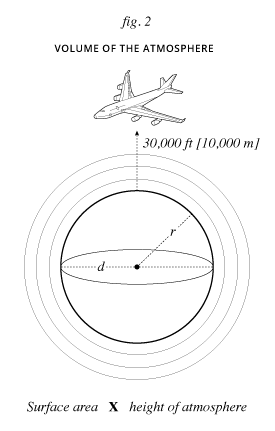 Airplanes fly at 30,000 feet (or 10,000 meters) so there is some air up there. However, there is not enough for us to breathe. Let’s use 10,000 m since it’s a nice round number. This gives a volume for the atmosphere of (4´10^14m^2)´(10^4m)=4´10^18m^3. Since there are 1000 L in 1 m^3, this means that the atmosphere contains about 4´10^21 (or about 4 billion-trillion) breaths. This is why scientists use scientific notation (10 raised to some power) because otherwise keeping track of all the -illions gets confusing. How far does Beyoncé’s breath travel? If you blow really hard, your breath might travel a few feet. Beyond that, we depend on wind and the motion of gas molecules (diffusion) to mix her breath throughout the atmosphere. At wind speeds of 10 mph, some of the molecules in one breath could travel around the Earth in a few months. We’ll assume that it takes a full year to spread a breath evenly around the globe so that the air around each us contains some of those molecules. How much of Beyoncé’s 3:47:29 PM January 2013 breath did you just inhale? Beyoncé exhaled this more than a year ago, so it should be thoroughly mixed throughout the entire atmosphere. Since the atmosphere contains 4´10^21 breaths, you will only inhale 1/(4´10^21)»2´10^-22 of that breath. However, since that 3:47:29 PM January 2013 breath contained 3´10^22, you just inhaled six molecules of that special exhalation. 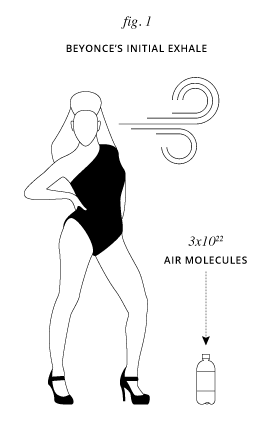 So for every breath you take, you inhale six molecules from every breath Beyoncé exhaled. Doesn’t that make you feel special? Pedantic physics note: all nitrogen molecules (or oxygen molecules or carbon-dioxide molecules …) are perfectly interchangeable. It is completely impossible, even theoretically, to trace a particular molecule back to a particular person’s particular breath. On the other hand, through the quirkiness of quantum mechanics, this means that ALL of the molecules you just inhaled have an equal (although terribly small) chance of having been exhaled by Beyoncé. Graphics by Jan Diehm and gif illustration by Eva Hill for The Huffington Post.